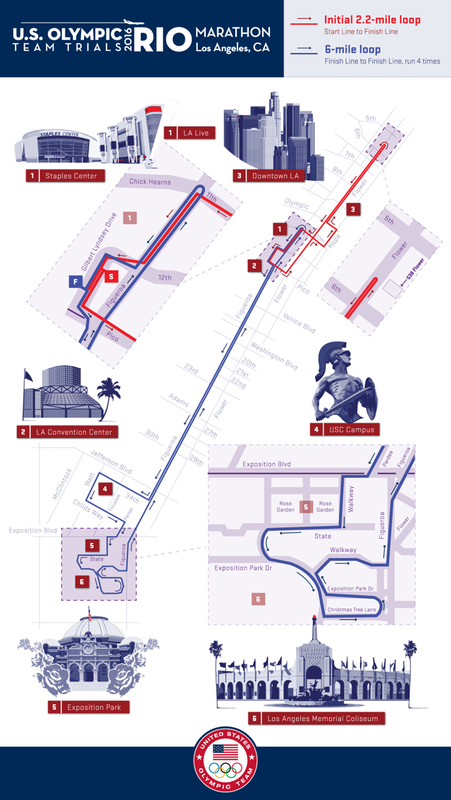 The course for the 2016 U.S. Olympic Marathon Trials in Los Angeles was revealed on Thursday. Organizers from the Los Angeles Marathon and United States Track and Field unveiled the complete 2016 Olympic Trials marathon course in a press release on Thursday. The race is set for the Feb. 13, 2016 in Los Angeles and will determine who will represent America at the Summer Olympics in Rio de Janeiro. Runners will first face a single two-mile loop that will go north of the start line through downtown Los Angeles. The criterion course will then have a six-mile loop that will travel into South Los Angeles, going through the University of Southern California campus and passing by Exposition Park and the LA Coliseum, which was the home of the 1984 Olympics. The six-mile loop will be repeated four times. The race finish line will be near the Staples Center and L.A. Live. Meb Keflezighi and Kara Goucher, members of the 2012 U.S. Olympic team for the marathon, were spotted in Los Angeles over the last few days getting a glimpse and test run of portions of the course.